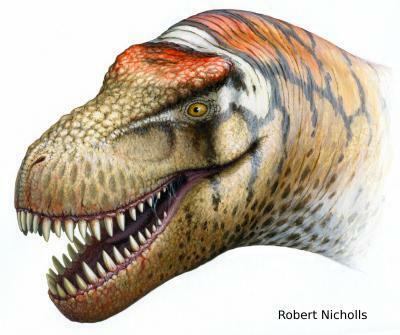 A gigantic theropod dinosaur has been discovered in China. Comparable in size and scale to the legendary T. rex, this new dinosaur is one of the largest theropod (carnivorous) dinosaurs ever identified by scientists. Alongside T. rex and the Asian Tarbosaurus, Zhuchengtyrannus magnus is one of a specialized group of gigantic theropods called tyrannosaurines. The tyrannosaurines existed in North America and eastern Asia during the Late Cretaceous Period, which lasted from about 99 to 65 million years ago. Zhuchengtyrannus magnus probably measured about 11 meters long, stood about 4 meters tall, and weighed close to 6 tons. Comparable in size and scale to the legendary T. rex, this new dinosaur is one of the largest theropod (carnivorous) dinosaurs ever identified by scientists. "Zhuchengtyrannus can be distinguished from other tyrannosaurines by a combination of unique features in the skull not seen in any other theropod," explains Dr David Hone from the UCD School of Biology and Environmental Science at University College Dublin, Ireland, the lead author of the paper. "With only some skull and jaw bones to work with, it is difficult to precisely gauge the overall size of this animal. But the bones we have are just a few centimetres smaller than the equivalent ones in the largest T. rex specimen. So there is no doubt that Zhuchengtyrannus was a huge tyrannosaurine." "We named the new genus Zhuchengtyrannus magnus - which means the 'Tyrant from Zhucheng' - because the bones were found in the city of Zhucheng, in eastern China's Shandong Province," says Hone. A key member of the international team of scientists involved in the study is Professor Xu Xing of the Beijing Institute of Vertebrate Paleontology and Paleoanthropology in China. Professor Xu has named more than 30 dinosaurs, making him the world leader in describing new dinosaur species. The tyrannosaurines, the group including T. rex and its closest relatives, were huge carnivores characterised by small arms, two-fingered hands, and large powerful jaws that could have delivered a powerful bone-crushing bite. They were likely both predators and scavengers. Together with nearby sites, the quarry in Shandong Province, eastern China where the remains of this huge carnivore were found contains one of the largest concentrations of dinosaur bones in the world. Most of the specimens recovered from the quarry belong to a gigantic species of hadrosaur, or duck-billed dinosaur. Research suggests that the area contains so many dinosaur fossils because it was a large flood plain where many dinosaur bodies were washed together during floods and fossilized.